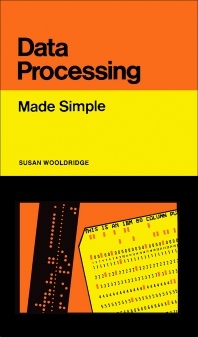 Data Processing: Made Simple, Second Edition presents discussions of a number of trends and developments in the world of commercial data processing. The book covers the rapid growth of micro- and mini-computers for both home and office use; word processing and the 'automated office'; the advent of distributed data processing; and the continued growth of database-oriented systems. The text also discusses modern digital computers; fundamental computer concepts; information and data processing requirements of commercial organizations; and the historical perspective of the computer industry. The computer hardware and software and the development and implementation of a computer system are considered. The book tackles careers in data processing; the tasks carried out by the data processing department; and the way in which the data processing department fits in with the rest of the organization. The text concludes by examining some of the problems of running a data processing department, and by suggesting some possible solutions. Computer science students will find the book invaluable.